I don’t even have words for this one, but everyone deserves a shot at love right? 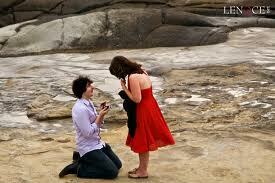 Well according to an article the NY Times this guy proposed through Groupon. Dana (a Groupon addict) was sent an email from Groupon that her boyfriend Greg was able to get Groupon to send to her the message, as she read it he was down on his knees with a ring and playing her favourite song. Now that’s a magic moment!